We cut the original recipe in half so that we ended up with only 4 individual cheesecakes. The original recipe can be found in Nick Malgieri’s Modern Baker cookbook. 4 4-ounce porcelain ramekins, buttered, and the bottoms lined with small disks of parchment paper (this is important), arranged on a jelly-roll pan. Set a rack in the middle of the oven and preheat to 300 degrees. Combine the cream cheese, sugar, and vanila in the bowl of an electric mixer fitted with the paddle attachment. Beat on medium speed until well mixed, about 1 minute. Spoon batter into prepared ramekins, filling them to within 1/4 inch of the top. 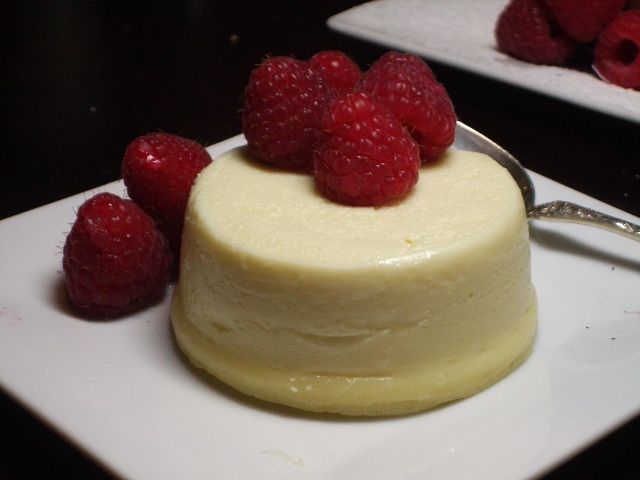 Place the jelly-roll pan in the oven and add about 2 cups of warm water to surround the outside of the cheesecake molds. Bake until firm and slightly puffed, about 35-40 minutes. 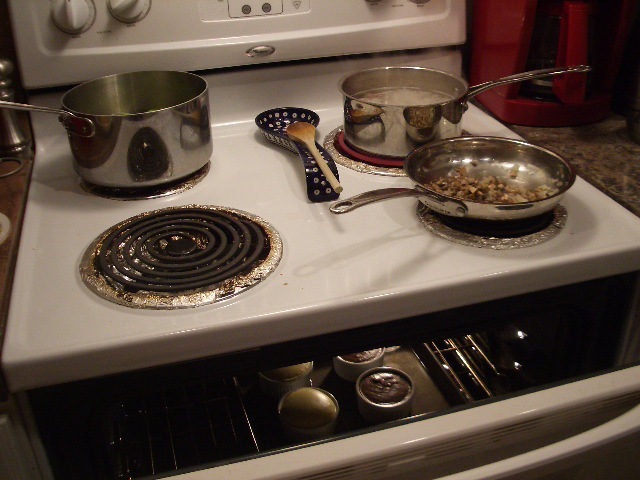 After the cheesecakes are ready, turn off the oven and leave the door ajar 4-6 inches. Leave the cheesecakes in the partially open oven for an additional 35-40 minutes. Remove the pan from the oven and unmold the cheesecakes onto a flat pan/plate covered with parchment paper. The cheesecakes should come out fairly easily, and the piece of parchment paper that was on the bottom of the ramekin should come out, too, and be stuck to the top of the cheesecake. Cover the cheesecakes loosely with plastic wrap and refrigerate until well chilled. To serve, use a wide spatula to transfer a cheesecake onto a plate. Remove the parchment paper round from the top of the cheesecake. Decorate with berries and ENJOY! 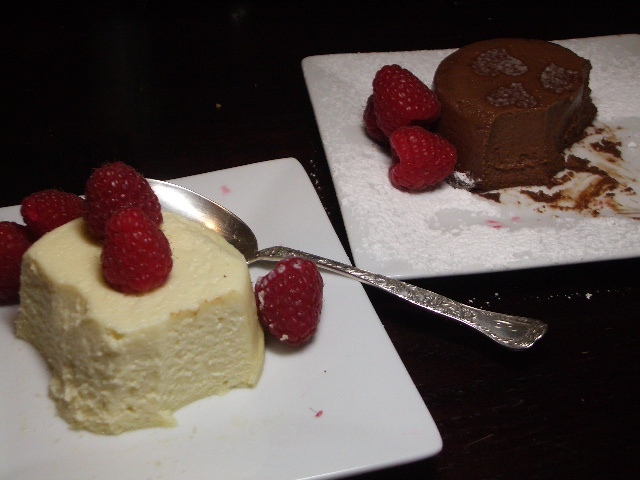 *** NOTE: As you can see – we made 2 normal New York Cheesecakes and 2 Chocolate Cheesecakes. If you want to make the whole recipe the chocolate variety (very good, and extremely rich), melt 3 ounces of bittersweet chocolate with 1/8 cup milk. Let cool slightly before adding to the egg mixture, before beating in the sour cream. Or maybe he now knows what a hot flash feels like – ha! 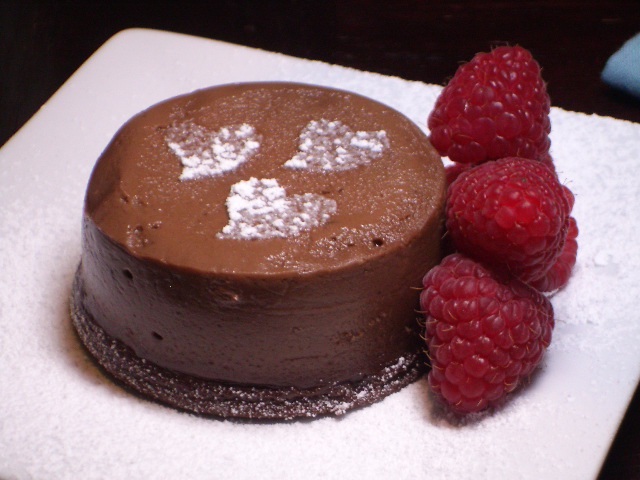 Love the cheesecakes – will you make them for me?